Raise funds for a great cause, while raising your hackles and adrenaline level. That’s the premise behind the fourth annual EddyFlower Vertical Challenge, which kicks off March 15 with a brand new – and earlier– competition for those on the East Coast. The concept is simple: athletes have 32 days to drop as much vertical as possible, while raising funds for non-profit organization First Descents, founded by Brad Ludden in 2001 to help cure young adults (of the emotional effects of cancer through outdoor adventure therapy, most notably kayaking. At the end of the 32 days, two awards will be given to the teams or individuals in each division, one for most donations, and one for most vertical. The competition gave out a total of $15,000 in prizes to the 2009 winners. 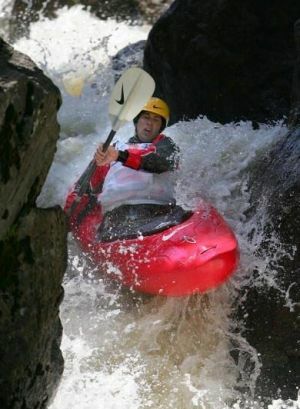 The 2010 First Descents program features ten camps focused on whitewater kayaking and five new camps that will focus on climbing and mountaineering. The 2010 event format has changed slightly to provide the Eastern boaters a better river flow window. Participants are instructed to compete in only one of the two time windows offered during the competition: the East window (March 15 – April 15) or the West window (May 15 – June 15). Prizes include kayaking trips, kayaks, paddles, outdoor cameras, sporting equipment, one-day ski lift tickets, clothing and more. Registration is now open to paddlers of all types and classes. Next articleLVM Launches Bikini Boat Carrying Contest! Win 100 Bucks!